Instead of helping students and recent graduates in Manitoba, the Pallister PCs are hurting them by raising the amount of taxes they will have to pay. They are doing this by eliminating the tuition rebate program which started in 2007. This, in my view, is a mistake. Eliminating the tuition rebate program will result in more recent graduates leaving Manitoba and because more will leave, there will be fewer Manitobans paying taxes and less revenue to the province. My plan if I am elected leader of the Manitoba Liberal Party October 21, is to push for reinstatement of the tuition rebate program, and should we have a Liberal government in 2020 to restore the rebate. Students and recent graduates deserve support, and Manitoba deserves to have more recent graduates stay in our province. The tuition rebate program offered graduates up to a 60% rebate on the total amount of tuition fees paid over their time at any post-secondary institution in the province, capped at $2,500 per year and $25,000 in total. Manitoba residents were able claim the rebate over a period of 6 to 20 years after graduating. The Pallister government is now eliminating this program. Graduates will be able to claim $500 of their tuition rebate in the 2017/18 fiscal year, and then it will be eliminated in 2018/19. The elimination of the rebate has the impact of increasing the taxes paid by recent graduates substantially. Were they to remain here (many may not now) the extra taxes paid by graduates would be $52.9 million in the 2017/18 fiscal year, a very large tax increase for a small segment of the population. Already, some recent graduates have decided to leave Manitoba, and in some cases whole families are leaving (they want to be with their children), with a substantial loss of tax revenue to the Manitoba government. If the result of the elimination of the tuition rebate is more people leave Manitoba and fewer stay to pay taxes, the result will actually be a loss of tax revenue rather than a saving depending on how many people leave. The government says the tuition rebate was not effective. But there is indeed evidence it has been quite effective. Indeed starting in 2008 there was a substantially larger increase in Manitoba's population than there had been in the years before the tuition rebate was implemented. 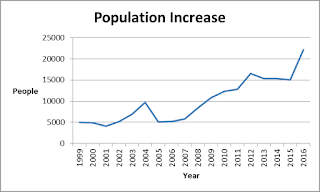 From 1999 to 2007, Manitoba's population increased on average 5,768 people each year. After the tuition rebate was introduced, Manitoba's population grew on average by 14,306 people each year from 2008-2016., as shown in Figure 1. While there may be other reasons for the faster growth in Manitoba’s population after 2007, the increase observed is consistent with the concept that the tuition fee rebate contributed to the retention of people in Manitoba and the growth in Manitoba’s population. We can take this further by asking whether the change in population after 2007 was related to a decrease in outmigration of Manitoban’s to other provinces. 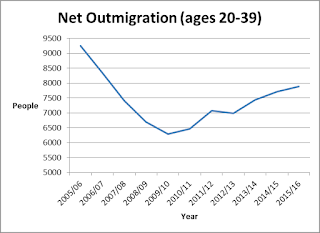 Such a decreased net outmigration would be expected if the tuition rebate was effective. Figure 2 shows that indeed outmigration of Manitobans to other provinces decreased substantially when the tuition rebate was introduced. in 2007. This is consistent with the tuition fee rebate having an effect to decrease out-migration of Manitobans as shown in Figure 2. 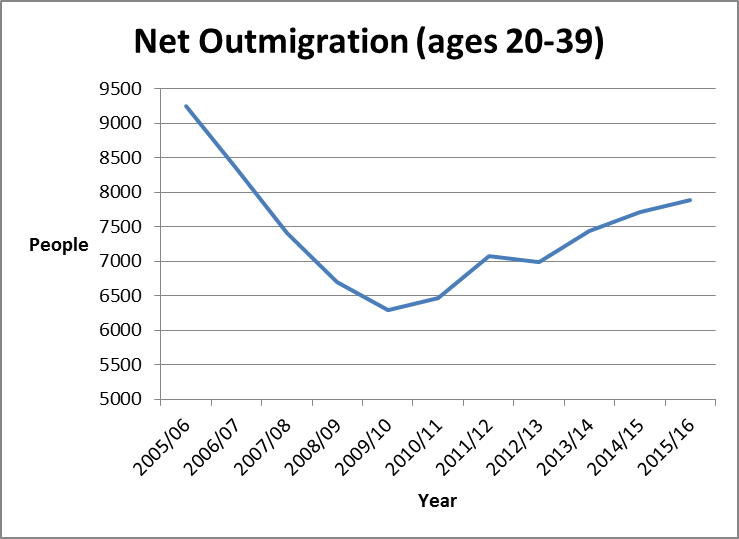 We can next ask whether this outmigration was primarily in those who were the target of the tuition fee rebate – those aged 18-39. 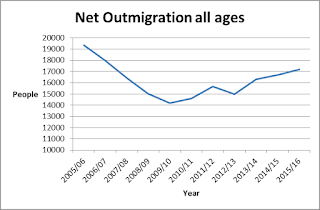 Indeed, the largest change (Figure 3) in outmigration was observed in this cohort of the population. 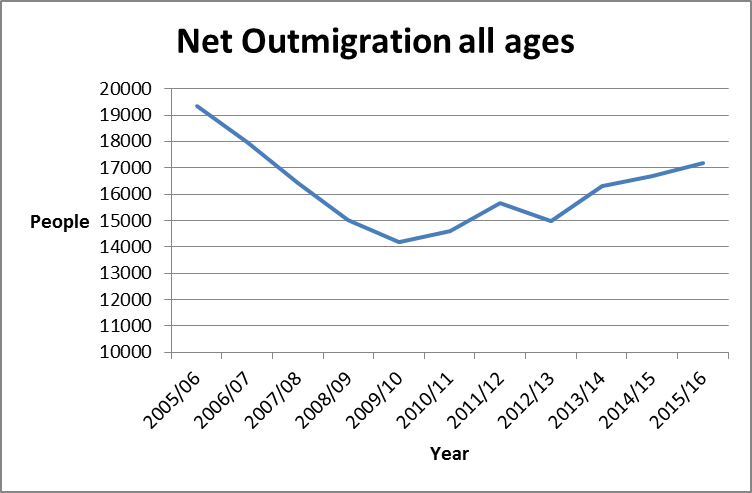 The fact that the largest decrease in outmigration occurred subsequent to 2007 is also consistent with the tuition fee rebate having an effect to retain students and recent graduates in Manitoba. Indeed, in a direct comparison, we can see that compared to the 2005/06 fiscal year, 32,841 fewer Manitobans left our province in the years following the tuition rebate being introduced up to and including the 2015/2016 fiscal year. 19,233 of those who stayed were aged 20-39. Did the Tuition Fee Rebate help enable recent graduates to get established in careers in Manitoba. There is some evidence that the tuition fee rebate was instrumental, for some students, in helping recently graduated students to get established in Manitoba including being able to pay off loans or to be able to afford to purchase a car or house necessary to be established in jobs and careers in Manitoba. Certainly, discussions with recent graduates shows that this money was used to help them launch their careers in Manitoba. Was the wind down of the program done in an optimum way? Given the evidence that the tuition fee rebate may have contributed to students and recent graduates staying in Manitoba, it is important to look at how the program was wound up. The program was drastically curtailed for 2017 and then ended completely after this. Many students and recent graduates had already planned the tuition fee rebates into their plans and their budgets. Changing their expectations in such a sudden way with respect to a program which they had been promised would be there for them has caught some students off guard and now wondering how they are going to continue with their current plans, and some considering, as a result, moving out of province. Based on the evidence presented above I believe that the tuition rebate should be reinstated. Indeed my plan if I am chosen leader would be to reinstate the tuition rebate should we have a Liberal government in 2020. Before reinstating it exactly as it has been operating from 2007 to 2015, I believe it will be important to consult with students to see whether the initial design was optimum or whether changes should be made to improve the tuition rebate program when it is reintroduced.